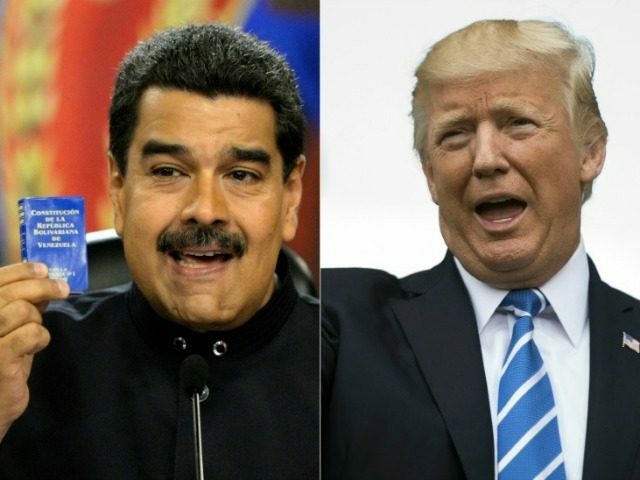 The Trump administration is considering plans to designate Nicolás Maduro’s socialist regime in Venezuela a state sponsor of terrorism over its support for Hezbollah and Marxist guerrillas, according to a report from the Spanish newspaper ABC on Tuesday. According to U.S. officials who spoke with the Spanish newspaper, administration officials are currently deliberating whether to add Venezuela to the list of state sponsors of terrorism over its support for groups including the Basque separatist movement ETA, Iran’s Lebanese terror proxy Hezbollah, and Revolutionary Armed Forces of Colombia (FARC). Officials have so far refused to officially confirm whether they plan to do so, although they are reportedly seeking the advice of the Department of Health and Human Services (DHHS), the Centers for Disease Control and Prevention (CDC), and the U.S. Agency for International Development (USAID). Sen. Marco Rubio (R-FL) is reportedly spearheading the effort, writing a letter to Secretary of State Mike Pompeo asking for his Department to look into the proposal. Other lawmakers supporting the move reportedly include Sen. John Cornyn (R-TX) and Sen. Cory Gardner (R-CO). Rubio has become Congress’s most prominent voice against the Maduro regime and the country’s worsening humanitarian crisis. In September, Rubio claimed there was a “very strong argument” for a military intervention in the country on the grounds of national security. Under the current State Department definition, countries that qualify as state sponsors of terror must “repeatedly [have] provided support for acts of international terrorism.” Countries currently on the list include North Korea, Iran, Syria, and Sudan, all of whom face severe economic sanctions as a result. The Obama administration removed Cuba from the list in 2015 despite that country’s ties to the FARC, whose leadership lived in Havana for years, and Hezbollah through agreements with Venezuela. “Taken together, the four main categories of sanctions resulting from designation under these authorities include restrictions on U.S. foreign assistance; a ban on defense exports and sales; certain controls over exports of dual use items; and miscellaneous financial and other restrictions,” the department’s website explains. Terrorist groups based in the Middle East find some support in Latin America despite the geographic distance. The call to fight in Iraq or Syria drew limited numbers of recruits from Latin America and parts of the Caribbean, which offered areas of financial and ideological support for ISIS and other terrorist groups in the Middle East and South Asia. In addition, in 2016 Hizballah maintained some financial supporters, facilitators, and sympathizers in the region that it could tap for support in building and expanding its activities there. The Trump administration has already imposed various sanctions on the regime that include a ban on Americans dealing in Venezuelan oil and personal sanctions on Maduro and members of his inner circle. Trump himself has also repeatedly refused to rule out the possibility of a military intervention, although such a proposal has repeatedly been met with both internal and international resistance.